Dolomite offers a wide range of Droplet Chips with different junction geometries, channel sizes and surface properties. All Droplet Chips have excellent optical transparency for clear imaging of droplets. Advanced hydrophobic coating treatments enable water-in-oil droplets to be generated as well as oil-in-water droplets formed in the untreated chips. Dolomite is a licensee of Japan Science and Technology Agency ("JST") under JST's microdroplet generation technology. This enables our customers to purchase and use our droplet chips for R&D purposes without any restriction from this comprehensive IP family. 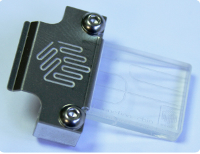 Available in both 100 and 190µm etch depth and both normal and hydrophobic versions. Quartz chips for improved optical transmission. The Double Chip Interface H provides the capability to directly interface 2 chips together and is designed for use with the Linear Connector 4-way (Part No. 3000024) to provide eight fluidic connections to 1.6mm OD tubing. An interface between 2 chips of dimensions 22.5 x 15 x 4mm is achieved via a precision perfluoroelastomer gasket aligned with the microchannels. One key application of the Double Chip Interface H is in double emulsion generation. This requires one hydrophilic Droplet Junction Chip (Part No. 3000158 or 3000436) and one hydrophobic Droplet Junction Chip (Part No. 3000301 or 3000437) for the production of droplets inside droplets. 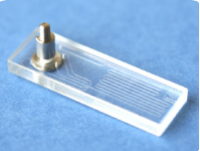 Droplet Junction Chip with header available in both 100 and 190µm etch depth and both normal and hydrophobic versions. The Droplet Junction Chip with header is a glass microfluidic device designed for generating droplets. The Droplet Junction Chip is available with attached header for ejection of droplets into a bulk liquid. This is useful for generation of emulsions since it reduces the likelihood of droplet coalescence, which can be an issue with some fluids on transfer from chip to tubing. In this configuration, the Droplet Junction Chip with Header is used with the Linear Connector 4-way to generate droplets on the X-junction and eject from the edge of the chip. Droplets can be collected using the Droplet Collection Module An additional benefit of this collection method is that droplets can be cured with UV light immediately after generation. Droplet Generation Chip with header available in both 50µm and 100µm etch depth and both normal and hydropobic versions. 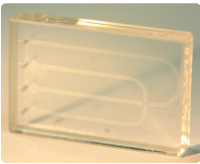 The Droplet Generation Chip with header is a glass microfluidic device designed for generating droplets made up of one, two or three reagents. Applications include monodispersed droplet formation, emulsion formation and Janus particle formation. The chip is supplied with a location pin that allows connection to the Circular Connector (Part No. 3000051). Available in both 50µm and 100µm etch depth and both normal and hydropobic versions. The Chip Interface H works in conjunction with two Linear Connectors 4-way, providing fluidic connections to glass microfluidic chips. 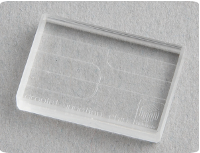 Quartz Droplet Junction Chip available in both 100µm and 190µm etch depth and both normal and hydropobic versions. Quartz Droplet Junction Chip are available in both 100µm and 190µm etch depth and both normal and hydropobic versions. The Small Droplet Chip is a glass microfluidic device designed for generating small droplets in the size range of 5-30µm. 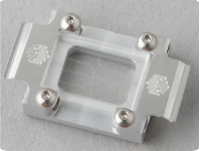 The Small Droplet Chip offers a flow focussing junction geometry with 14 x 17µm cross-section at the junction. Applications are found in drug delivery, materials science and food research where smaller droplets allow for the improved control over the targeting and release of active compounds. Available in both normal and hydrophobic versions.